How bad do things get during the third season of the Into the Badlands TV show on AMC? As we all know, the Nielsen ratings typically play a big role in determining whether a TV show like Into the Badlands is cancelled or renewed for season four. Unfortunately, most of us do not live in Nielsen households. 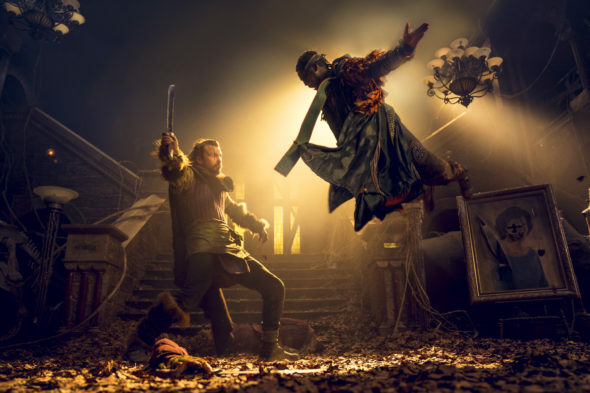 Because many viewers feel frustration when their viewing habits and opinions aren’t considered, we’d like to offer you the chance to rate all of the Into the Badlands season three episodes here. *Status update below. An AMC martial arts drama, Into the Badlands stars Daniel Wu, Eleanor Matsuura, Stephen Lang, Sherman Augustus, Babu Ceesay, Orla Brady, Aramis Knight, Emily Beecham, Ally Ioannides, Lorraine Toussaint, Ella-Rae Smith, Lewis Tan, Dean-Charles Chapman, and Nick Frost. The post-apocalyptic series unfolds centuries into the future, in a feudal society called the Badlands.